The University of Wisconsin-Whitewater has qualified as the 12th and final team in the Men’s Division II field after winning the Upper Midwest 7s qualifier. Princeton University will replace Navy in the Women’s field. LAFAYETTE, Colo. – Thirty-nine clubs of the 40-team field for the May 19-21 USA Rugby College 7s National Championships at Infinity Park in Glendale, Colo., have been determined. Three separate divisions will compete amongst the very best teams across the country in order to crown National Champions in Men’s Divisions I and II, as well as a 2017 Women’s National Champion. Broadcast coverage of the 2017 College 7s National Championships will be provided by The Rugby Channel. The 16-team Men’s DI field will be headlined by 2016 College 7s National Champions Saint Mary’s College. Nine other teams return from last year’s DI bracket, including the winner of the 2015 Cup Final, Lindenwood University, while a number of teams will be making their first College 7s National Championship appearances like conference champions in sevens Florida International and Stanford. Nine of the 16 teams represent D1A Rugby. The Men’s Division I tournament will kick off Friday, May 19, while the other two brackets will get underway Saturday, May 20. Eleven of the 12 spots in the Men’s DII College 7s bracket have been filled, with the final bid being awarded to the winner of the April 6 Upper Midwest 7s tournament. Three teams competing at this year’s Nationals were in Cary, N.C., for last year’s championship event. Principia, which won the inaugural Men’s DII National Championship in sevens, returns to College 7s for the fourth consecutive year. A star-studded group of the very best women’s college programs in the country will battle it out for sevens supremacy at Infinity Park May 20-21. Eleven-time 15s National Champion and 2015 College 7s champ Penn State will be eyed as one of the favorites. The team Penn State beat to hoist the 2015 title, Central Washington, also made the cut. Last May, Life bested Lindenwood in the Cup Final of the College 7s National Championships. Both D1 Elite squads will be expecting advancement to the Cup rounds again this year. Davenport, Life, Lindenwood, and Texas A&M represent the schools that qualified both their men’s and women’s rugby programs. 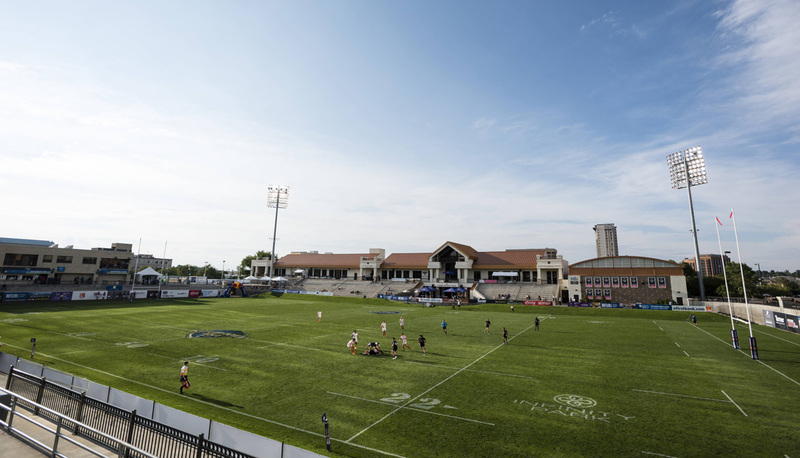 USA Rugby College 7s National Championships’ arrival in ‘Rugbytown USA’ will see the 40 competing teams utilize one of the country’s premier rugby facilities. In addition to state-of-the-art looker rooms, the championship squads should enjoy making line breaks on the grass pitch of Infinity Park’s 5,000-seat stadium, which includes an LED scoreboard, stadium lighting, and a P.A. system. Tickets for the three-day event crowning three National Champions can be purchased on Infinity Park’s website. For fans unable to attend this year’s College 7s National Championships, each of the tournament’s 111 games will air live on The Rugby Channel.